Thank you for your support during this difficult time. Please enhance this tribute to James by adding your memories and photos. 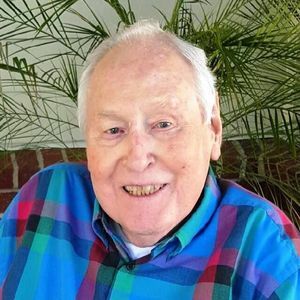 James Harold Wallace James Harold Wallace, 87, of Summerville, South Carolina, husband of Betty Stanford Wallace entered into eternal rest Tuesday, March 12, 2019. His Memorial Service will be held Friday, March 15, 2019 in The Chapel of the Village of Summerville (The Presbyterian Home), 201 West 9th North Street at 4:00 p.m. The family will receive friends one hour prior to the service. Interment will be held in Elmwood Cemetery, Birmingham, Alabama at a later date. Arrangements by J. HENRY STUHR INC., WEST ASHLEY CHAPEL. James was born September 18, 1931 in Birmingham, Alabama, son of the late Thaddeus Frank Wallace and Jessie Luvernon Gay Wallace. He was an U.S. Air Force Veteran serving during the Korean Conflict. James was a retired Pitney Bowes service manager and he enjoyed golf and gardening. He was a was a member of John Wesley United Methodist Church. He is survived by his wife of 62 years, Betty Stanford Wallace of Summerville, SC; daughter, Janet Wallace Deavor (James) of Charleston, SC; two grandchildren Luke and Grace; brother, William Wallace of Maylene, AL; sister Martha Bentley of Raleigh, NC; nieces and nephews. In lieu of flowers, memorials may be made to Edmundite Missions, 1428 Broad Street, Selma, AL 36701 or Hands of Christ, P.O. Box 30703, Charleston, SC 29407. Condolences for your loss. Just thinking of all the great memories of Birmingham, Ft Lauderdale, Columbia and Charleston. You're family is in our thoughts and prayers. Life Stories provides friends and families a forum to post their favorite stories and memories of James Harold Wallace ensuring the precious experiences are never forgotten. Share joyful times, post a photo that captures the moments you cherish, and allow others to reply, relive and remember.